Structural Balancing is another unique feature of the art of Polarity Therapy. It deals with the way in which the body aligns itself in relation to external forces. These external forces can be interpersonal, environmental, cultural and of course gravitational. A body that is twisted and bent can still survive to a ripe age however a toll is taken in terms of restriction of energetic flow throughout the body, interruption of optimum organ functioning and a lack of variety in emotional states. A body that is unable to change and adjust to life's changing demands puts stresses and strains on the individual that can go unnoticed for years until along comes "the straw that breaks the camels back" so to speak. Polarity has many effective protocols for re-aligning the body which although at a superficial glance look much like pure physical manipulations are none-the-less performed with the express purpose of engaging and then re-establishing energetic flow. The energy can be view as the underlying template that influences the physical form. If the energy pattern becomes distorted then physical manipulation alone will be insufficient as the disturbed energetic flow will cause the physical body to eventually deviate from true again. The innate wisdom of the body will be constantly trying to align the body in its vertical position and over time this causes overlays of compensation to occur that the Polarity practitioner will have to help unravel. Thus what on paper looks like a series of manipulations become an art form and a joint exploration of a unique life history. In the structural work particular attention is paid to the position of the sacrum which form the "keystone" of the structure as a whole. True to the Polarity principles although the focus may be the sacrum attention is also given to its corresponding poles so that eventually all three poles are brought into alignment. After a series of corrections through the entire body the sacrum is finally balanced with its positive pole at the occiput and its negative at the heels .In order to do this the practitioner needs to be able to assess the body in its standing posture and for this a gravity board and plumb line is used so as to observe the deviations from a centre line. A house is only as good as its foundations and so work on the structure begins at the negative pole, the feet, and in particular the position of the heel bones. 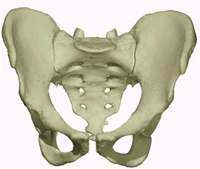 The word pelvis means basin and it is composed of several articulating or fused bones and of course associated muscles. It is the centre of gravity for the whole body. It receives the weight of the upper body and transmit it to the legs and it also absorbs stresses from the lower body when walking and running for instance. The shape of the pelvis varies considerably from person to person. The sacrum is the posterior, wedge-shaped component of the pelvis. It is located between the two ilia and is in fact composed of five fused vertebrae. 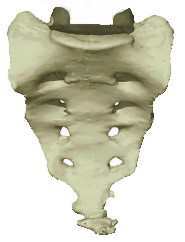 The first sacral vertebra articulates with the fifth lumbar vertebra and is known as the sacral base. The fifth sacral vertebra articulates with the coccyx or tail bone and is known as the apex of the sacrum. The anterior sacroiliac ligament binds the sacrum to the medial surface of the ilium and there is a series of posterior ligaments that connect the ilium to the sacral crest. Thus the sacrum is held firmly in place. However under stress it is possible for the muscles and ligament attachments to pull the sacrum out of alignment. This movement may only be a couple of millimetres but is enough to cause extreme pain and distress. The sacral base will tend to 'slip' inferior (downwards) and anterior ( inwards) on one side thus leaving the other corner of the sacral base superior and posterior. It is critical that the practitioner recognises the relevant position of the sacral base and there are several indicators to help with the assessment. There may be pain around the mastoid bone. Tension in the gluteal muscles on this side. In order to ease pain and in response to the body's perceptions of 'uprightness' the body compensates for any movement of the sacral base. In the case of a right anterior-inferior base the lumbar spine will , when it can, move to the right in response to this shift . This shift can cause a compensatory movement to the left to occur above the diaphragm in the thoracic vertebrae . Further compensation can then occur in the cervical vertebrae and at the cranial base. A lumbar spine that does not move to the right with the sacral base creates great stress and consequent strain at the lumbo-sacral junction. The compensations that the individual body makes range from the subtle to the gross and each case is treated accordingly. * For further information on this topic refer to "The Art of Polarity Therapy - a Practitioners Guide" by Phil Young. Why not set up a special Structural Balancing workshop in your area - email us for details.